Miniatur Wunderland double-DVD inclusing Switzerland. In more than 210 minutes (!!!) 2 DVDs feature the beauty of the Wunderland with all it's craziest and most spectacular stories, interviews, and details. For more information, please click the picture. ... or a large world in a small scale? Decide for yourself and embark on a journey through the Miniatur Wunderland. A two-hour movie will take you to a world full of marvels. Be it deep gorges, buzzing towns, or an open-air concert attended by more than 21,000 visitors - the world's largest model railroad layout offers lots of scenes to admire. Hamburg, America, Scandinavia, Switzerland , or Knuffingen; this movie shows everything you might have discovered during your visit - and lots more! Exclusive interviews reveal exiting background information directly from the makers of the Miniatur Wunderland. Bridge builder, boss, or model builder - each one offers a glimpse behind the scenes of the world's largest model railroad layout. We also explain how the Car-System works. Moreover,you will experience hilarious day-night simulations at various sections of the layout! To round out your tour, you will have a cab-ride through the Swiss section. Experience the most exciting moments on the world's largest model railroad as if you were there. 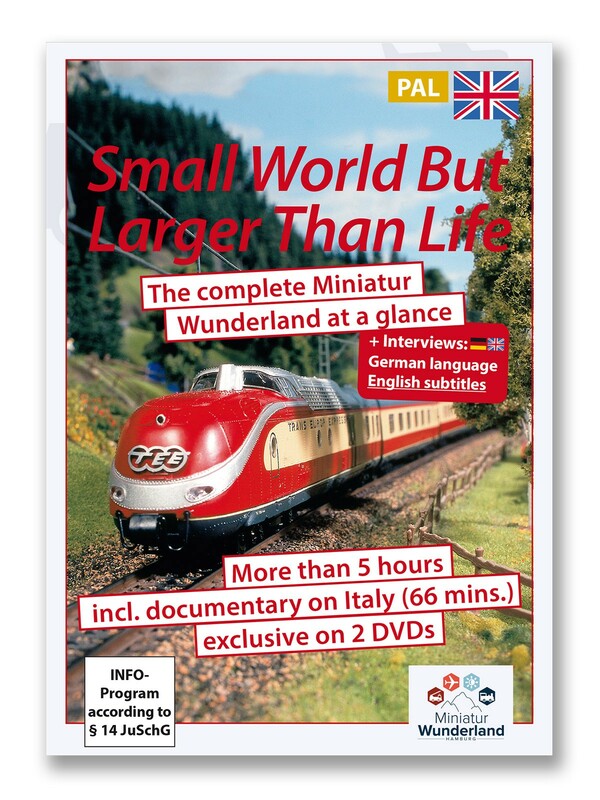 You never lived to see the Miniatur Wunderland as complete as on this DVD edition! Spectatuclar panoramic views, the most beautiful buildings and structures, and the craziest scenarios. From a knight's festival to aliens to the many fire fighter missions - all is featured on this double-DVD. Dive right into a small empire and experience the most exciting journey, you can dream of!